MANHATTAN SUPREME COURT — The twin brothers of Ramarley Graham, an unarmed Bronx teen shot dead by police earlier this year, contributed to a culture of violence that led to their brother's death, a judge said Wednesday, drawing a stinging rebuke from the boys' family. 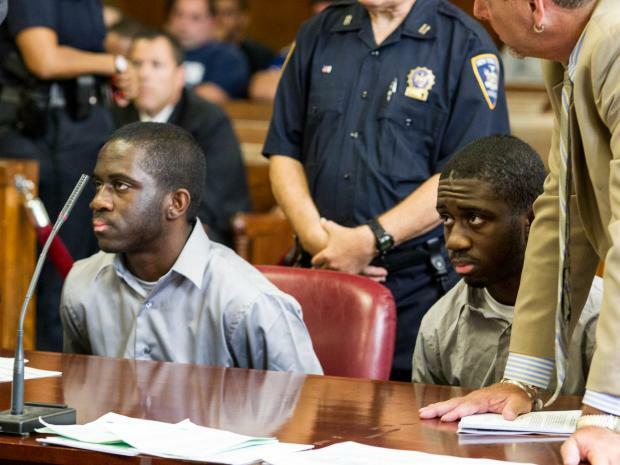 Hodean and Kadean Graham, 19, were sentenced to up to four years in prison for being part of a violent gang that sold PCP and imported high-powered weapons into Harlem, which Manhattan Supreme Court Justice Edward McLaughlin said helped create an atmosphere that led to the police activities that caused Ramarley Graham's death. "No one, of course, is accusing either of you of holding the gun which killed your brother," McLaughlin said. "But the acts of your conspiracy, spanning four years, including many shootings and ending just months before his death, is an unavoidable and integral part of the context in which that tragic event occurred and likely will be judged." Ramarley Graham, who lived in Wakefield with his grandmother, was shot to death by NYPD Officer Richard Haste in February after he was chased from White Plains Road and East 228th Street to his home nearby by police who were investigating a report of a drug deal. 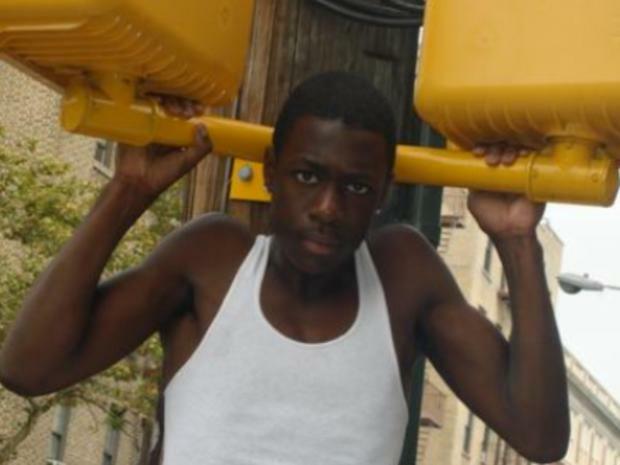 Cops believed they saw a gun in Ramarley Graham's waistband and followed him home before breaking through the door of his apartment, confronting Graham in the bathroom and fatally shooting him in the chest. Police say a single bag of marijuana was found in the toilet. "If the shooting is found to have been justified, it will be in the context of the incessant gun violence in the city to that point," McLaughlin said. "If the shooting was not justified, the shooting will have been an unreasonable reaction to the gun violence in the city up to that point." Haste pleaded not guilty to manslaughter charges in Bronx Supreme Court. "This situation provides an opportunity to demonstrate the unanticipated effects of gun violence," McLaughlin said. The twins sat emotionless as McLaughlin invoked their deceased brother. But Constance Malcolm, Ramarley Graham's mother, said she was "bothered" by McLaughlin invoking her dead son. During the trial, McLaughlin rebuked defense lawyers for trying to link the death of Ramarley Graham to the trial of his twin brothers. "The police killed him," Malcolm said. "It bothered me because before he never said anything about Ramarley. He didn't want Ramarley's name used in the whole trial." Yvette Graham, mother of the twins, accused McLaughlin of trying to "put up a show." "He don't want to help the black kids," she said. McLaughlin has used past sentencings to urge Harlem residents to halt gang and gun violence in their neighborhood. In November 2011 McLaughlin used the sentencings of five top members from the crack-dealing "2 Mafia Family" and "Goons on Deck" crew to exhort residents. "If you do nothing, you are complicit," he said then. Members of Harlem's activist anti-violence community applauded McLaughlin's call in November. Since then, gun violence has continued to explode in Harlem. "Something different and more pointed needs to be injected," McLaughlin said in rejecting arguments from defense lawyers Frank Rothman and Neville Mitchell to sentence the twins, who were enrolled in community college, to a short jail stint and community service with kids highlighting the danger of guns. Mitchell called McLaughlin's comments "totally off base," "out of context" and "crap." "So these young men are responsible for the death of their own brother because of gun violence, but the actor was a police officer who stereotyped a black youth?" Mitchell said. "To suggest they are responsible for their brother's death is nothing short of ludicrous." McLaughlin said the brothers displayed a dogged determination to pursue the gang lifestyle, persisting even as members of their crew were shot at, participated in shootings and even were murdered. They continued their illicit ways despite parents trying to get them to do the right thing. Kadean, Franclot and Hodean Graham leave Manhattan Supreme Court. Assistant District Attorney Andrew Searle accused the brothers of enrolling in college after they were indicted to influence the jury, a charge the twins' lawyers denied. Texts from twins' phones show pictures of guns, prosecutors said, adding that they sold PCP and turned their neighborhood into an "open air drug market" and then used the proceeds to arm themselves. "They are responsible for the shootings, violence and damage to the community," Searle said. Hodean and Kadean Graham helped to lead a violent street crew know as "GoodFellas" that terrorized their turf focused at 129th Street and Lenox Avenue, prosecutors said. Gang members sold drugs and imported high-powered weapons into the neighborhood such as a Chinese SKS semiautomatic rifle and a TEC-9 machine pistol, prosecutors said. They then used those weapons in shootings and confrontations with rival area crews. The FBI and NYPD say they purchased 15 such weapons from the crew or their associates during a four year period from 2007 to 2011. According to Manhattan District Attorney Cyrus Vance, another 9 loaded weapons were found as authorities executed search warrants and made arrests. Witnesses at trial described allegedly seeing one of the Graham twins fire four shots from a .380 semi-automatic weapon at a crowd in 2009 after a dispute with a crew from the Grant Houses. The brothers, however, were found not guilty of the most serious charges they faced on June 19 after a jury trial. Hodean Graham was acquitted of attempted murder, assault and weapons possession. His twin brother Kadean, was also found not guilty of weapons possessions charges. The brothers were both convicted of conspiracy. "I thought it was a cheap shot that didn't add anything to the proceedings," said Rothman, aone of the twins' defense lawyers. "Sentence individuals rather than making statements about the community and sending messages to communities." But McLaughlin disagreed, sentencing the twins to 1 1/3 to four years in prison. "Guns in New York City and Harlem in particular have wrecked havoc on the populace for decades," McLaughlin said. "These firearms are held by residents, pointed by one resident at another resident, and fired at close range by a resident looking at the intended victim."